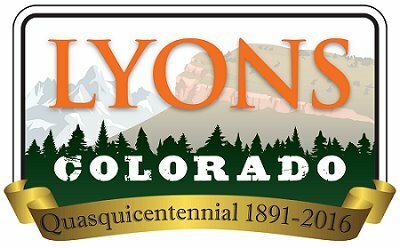 Good Old Days is a longstanding, highly-anticipated outdoor event that brings people from Lyons and the surrounding region together in a celebration of community. The event features a full schedule of Live Music & Entertainment, Beer Garden & Food Vendors, Rides, and activities for all ages. 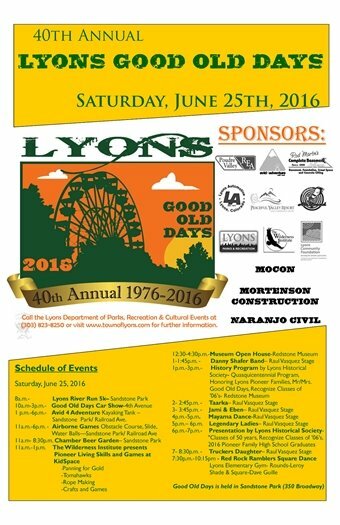 2016 marks the 40th year of Lyons Good Old Days! The Lyons River Run 5k kicks off Good Old Days, and proceeds benefit the Town of Lyons Parks and Recreation Department. The race starts at 8:00AM at the intersection of Railroad and 3rd Ave. All participants will receive a souvenir bag, and peace of mind knowing they are supporting a great cause! Volunteer at Good Old Days! Please direct questions and volunteer interest to Marissa Davis at recreation@townoflyons.com. Parking in the RTD lot, Railroad Ave., and 4th Ave. between Broadway and Railroad is closed beginning at 12 a.m. (midnight) on Saturday, June 25. Vehicles left overnight through Saturday morning will be towed. Parking in the RTD lot and on 4th Ave. will reopen after the Good Old Days Car Show. Railroad Ave. will be closed for the duration of the day, beginning with the River Run 5k, and will reopen around 7 p.m. The Post Office will be accessible from the east entrance. 3rd Ave. south of Broadway will be closed throughout the River Run 5k. See race map for more information. Stop by the Block to Blanket project area from 1-4 PM on Saturday, June 25, at Sandstone Park. Block to Blanket is an intergenerational community craft event sponsored by the Lyons Historical Society Heritage Faire during Lyons’ Good Old Days. For Block to Blanket, community members of all ages will turn upcycled 100% wool sweaters into a warm and colorful blanket to be raffled at a future event as a benefit for the Lyons Redstone Museum. A contemporary cross between old-time quilting bees and Sheep to Shawl competitions, Block to Blanket is an afternoon community event in which donated sweaters (previously washed and felted by volunteers) are cut into squares and sewn into a blanket. Based on the idea that many hands make light work, tasks will be available for children of all ages, from sorting and cutting to designing and sewing. Come help make something functional and beautiful from mundane materials! To volunteer time or a portable sewing machine for the event, contact organizers Priscilla Cohan, 720-245-3945, or Kayann Short, 303-823-0975.